This is a Java based cross-platform tool that can be downloaded from SourceForge. It allows you to select what pages will be processed by pages numbers, but not by preview. 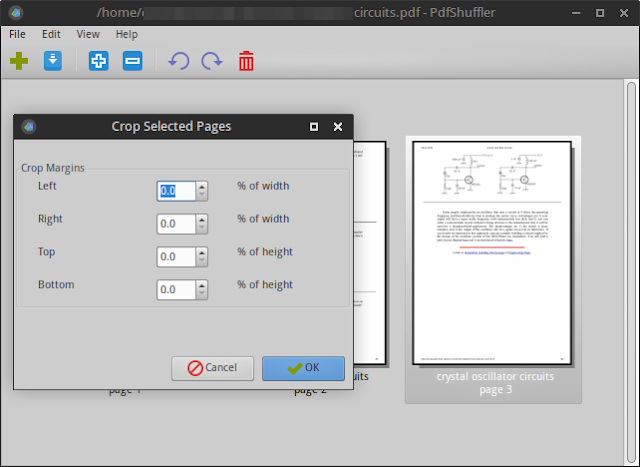 Once you load a PDF document it will prompt you to enter a page range to crop. After you selected some pages or all by clicking Cancel in that dialog, it will automatically calculate crop boxes and will display previews. You can define individual crop boxes for each page. You can adjust crop box size by clicking and dragging the top left and bottom right corners. But more important, in the Rectangle menu you will options to set size and position of crop box using milimeters. To select a crop box, you have to right click the rectangle and choose Select/Deselect rectangle. And now you will also see the rectangle size in milimeters. 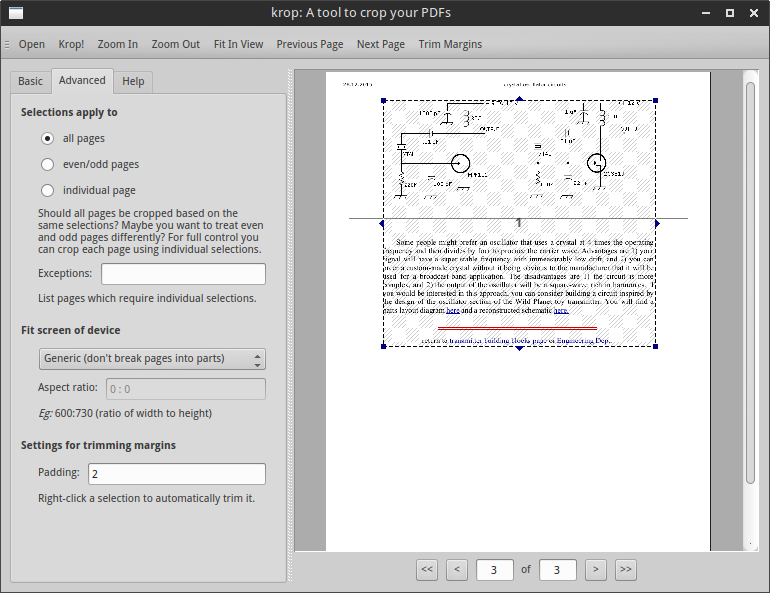 This is a PDF utility found in most Linux repositories. 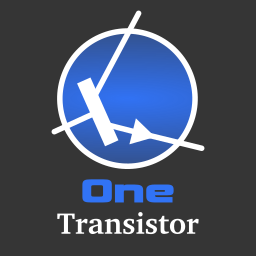 You can also get it from SourceForge. It allows you to select pages that you will apply a crop box to in a visual way using previews which is a good thing. You can also use different size crops for each page. But the fact that it uses percent instead to specify crop box size and location makes it quite difficult to use. There is no way to draw the crop box with the mouse either. And no automatic cropping. 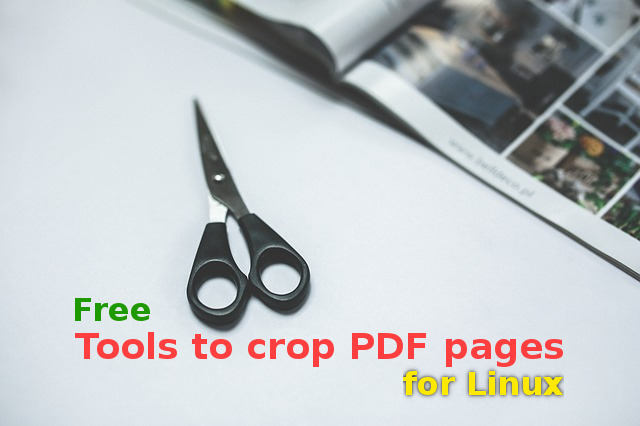 Here is a Python script that use PyPDF2 library to crop PDF pages. 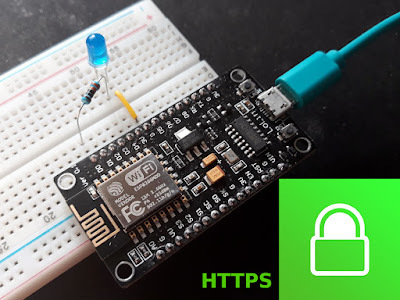 You can get it from GitHub. Be sure to install python-pygoocanvas python-poppler python-pypdf2 and you can launch the script. This is a simple utility: no page selection, no different crop boxes for each page. The only way to draw the crop rectangle is by using the mouse. And while you can adjust it on each page, it will apply to all. No automatic crop. 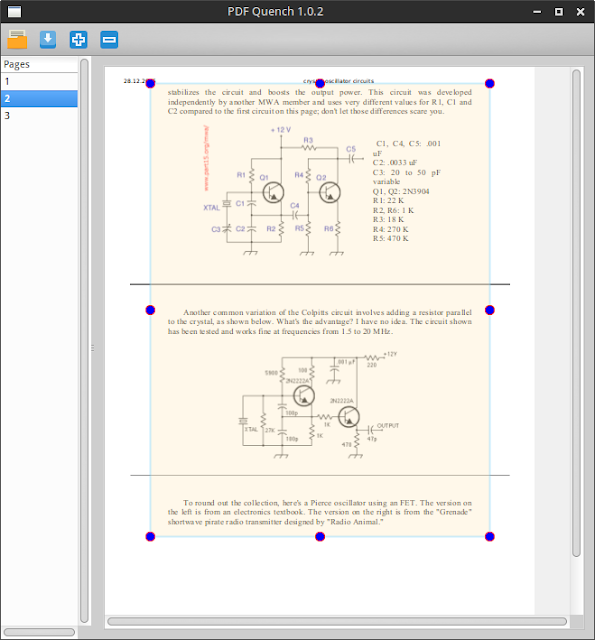 Qt based PDF cropper with a lot of features that should be available in the repositories. Can be found also at Armin Straub's site. You can choose input page range and you can apply different crop rectangles to every page. It features automatic margin cropping. The only way to draw a crop box is by using mouse cursor. However you can right click that selection and choose to automatically trim white margins of that selection only. Unfortunately, no way of specifying rectangle size using measurement units. It's time to go to the command line. This is an utility found in texlive-extra-utils package. If you run it without options, it will automatically crop white margins of all pages. There is no way to select page range or apply different crop boxes to different pages. The crop box size is defined in pt units. 1 pt represent a pixel at 72 DPI, so 1pt = (1 / 72) x 25.4 = 0.35mm or 1mm = 2.83pt. It has however an useful feature. 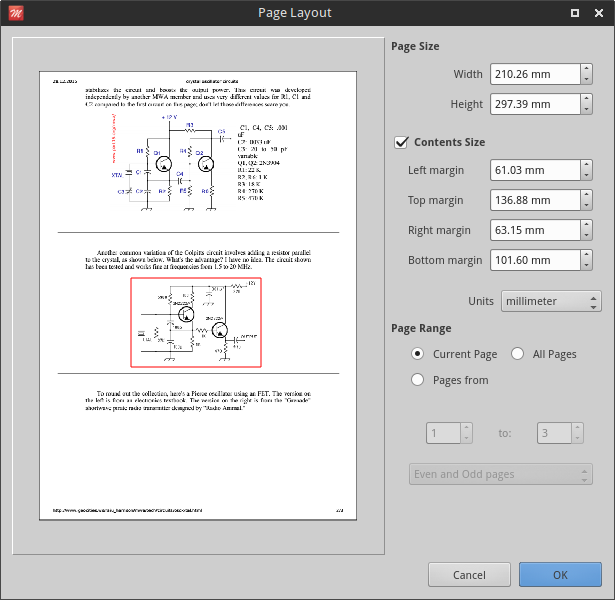 You can enlarge page size of a PDF document with it by specifying a crop box equal to the page size then adding margins. An usage example can be found in How to add printer marks and bleeds to PDF documents article. All the above were open source. Here is a PDF editing suite free for personal non-comercial use. 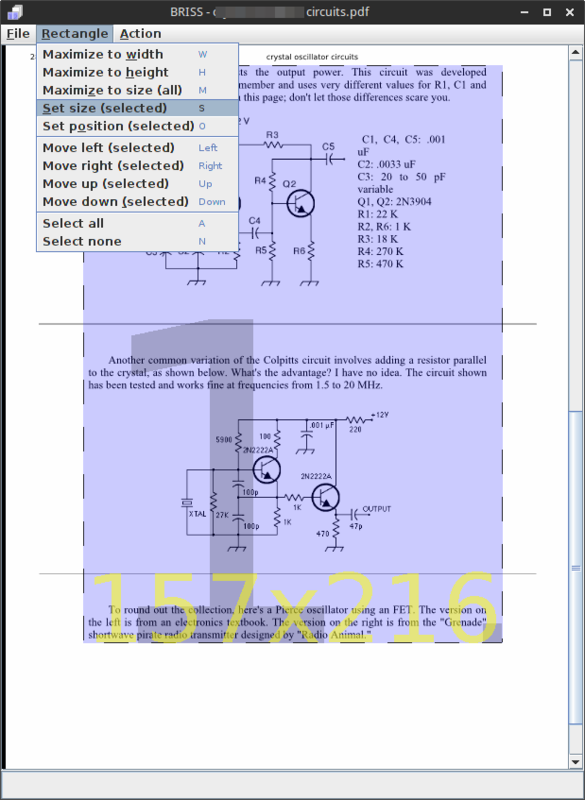 You can get Master PDF Editor from Code Industry website. It has a lot of PDF editing functions and it is also a fast viewer. You can add individual crop boxes for each page or page range. To start, go to Document - Crop pages. Then draw a rectangle on any page of any size. A dialog will open that will allow you to configure crop box size by different units and page range. No automatic crop available. From the above table BRISS and Krop seem to have the most features. Which one do you use the most? 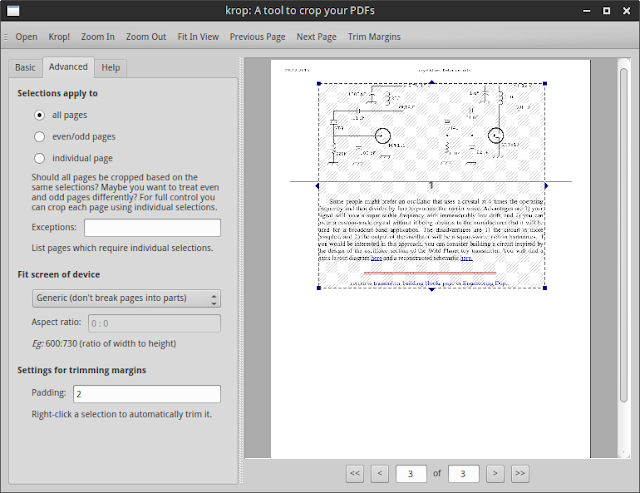 I need a command-line tool which will adjust the PDF border to the content box. This may often mean doing what pdfcrop does, ie eliminating whitespace, but sometimes it means increasing the bounding box to recover content which has been cut off by the PDF page border (e.g. by matplotlib!). I am not sure you include this feature in any of the software you cover, do you? Inkscape does it very nicely, but I'm looking for a command line tool which won't mess with the fonts, etc. Have you tried with pdfcrop? It can add whitespaces, but I don't know if it will show content outside of crop box.